Fernando Alonso set the fastest time of the second qualifying practice for the 24 Hours of Le Mans, although neither of the leading Toyota TS050 HYBRIDs improved yesterday’s lap times. Alonso began the session in the #8 Toyota and completed eight heavily disrupted laps caused by many incidents suffered by LMP2 and GTE machinery. That meant he had just two clean flying laps and he set a 3m18.021s best time on his second run, after Sven Muller put the #94 Porsche 911 RSR GTE car into the barriers on the approach at Indianapolis and caused a red flag when he hit the tyre barrier. That meant Alonso’s best lap was almost eight tenths slower than team-mate Kazuki Nakajima’s provisional pole time from Wednesday night’s qualifying. Team-mate Sebastien Buemi also lapped close to Alonso’s best time, as did Jose Maria Lopez in the #7 Toyota. The #7 Toyota had several moments on track in the hands of Mike Conway, who twice went off at Dunlop. There were few improvements elsewhere in the LMP1 class, meaning that the best placed non-hybrid LMP1 car is still the #17 SMP Racing BR-1 car shared by Stephane Sarrazin, Egor Orudzhev and Matevos Isaakyan. The only LMP1 contenders to improve their positions was the two Ginetta-Manor cars, with Alex Brundle taking the #6 up to ninth, clear of all the LMP2 runners, with a 3m24.343s lap. Brundle’s time leaves that car 1.8s slower than the ByKolles in eighth and 7.073s off the ultimate pace set by the leading Toyota. The session was red-flagged with over half an hour remaining when Giorgio Sernagiotto crashed the #47 Cetilar-Vilorba Corse on the approach to the first chicane, which the team attributed to a front-right puncture. The Italian emerged from the wreckage unaided. 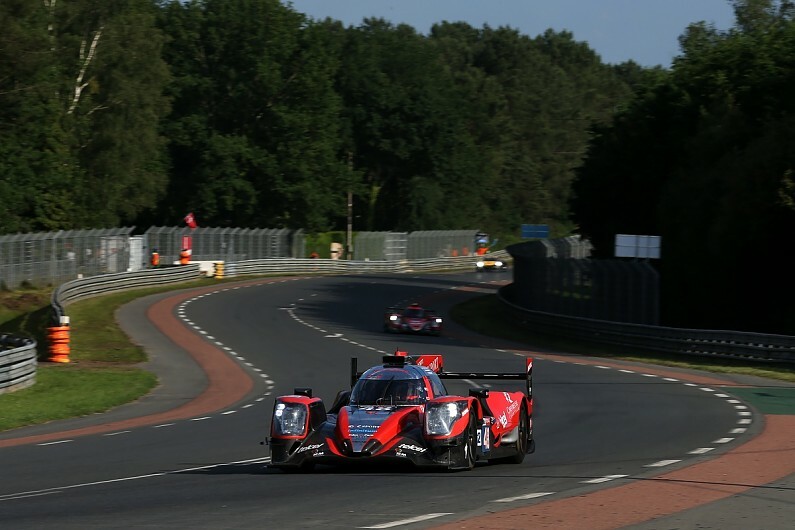 The order at the top in LMP2 was unchanged prior to the stoppage, with only one change in the minor placings deposing the fastest Ligier to seventh. Paul-Loup Chatin’s bechmark time from Wednesday night in the #48 IDEC Sport ORECA remained unchallenged, ahead of the #28 TDS Racing ORECA of Loic Duval. The only major improvement was from Tristan Gommendy in the Graff-So24 ORECA, which moved into sixth place in an incident-filled session. Prior to Sernagiotto’s accident, single-seater convert Norman Nato was fortunate to escape without damage from a high-speed spin at the Porsche Curves in the #35 SMP Dallara, before two-time class-winner Nicolas Lapierre broke the suspension on his #36 Signatech-Alpine at the Ford chicane and spun into the gravel, leading to a slow zone. 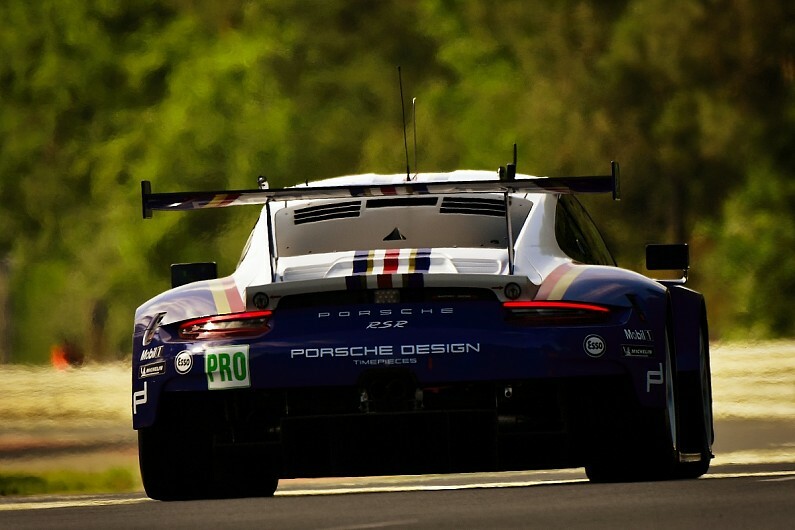 Porsche maintained control of GTE Pro, as just one of the 17 cars in the class managed to improve its best time from Wednesday’s first qualifying. That was the #93 CORE autosport-run 911 RSR, which was seventh overnight but rose to fifth with a lap of 3m49.621s by Patrick Pilet – 2.117s slower than Gianmaria Bruni’s benchmark in the #91 Manthey Porsche. The Weissach marque continues to hold a 1-2 with its two retro-liveried cars, the #91 and the #92, while Ford’s top two cars, the #66 and #68, remain on the second row. Ferrari’s lead 488 GTE Evo, the #51 AF Corse car, has dropped to sixth as a result of Pilet’s improvement, ahead of the remaining #94 Porsche. Ford’s eighth-placed #67 car was damaged when Andy Priaulx dipped a wheel on the grass entering Tertre Rouge, spun and hit the barriers backwards. The three-time WTCC champion was able to get back to the pits unaided despite losing a chunk of rear bodywork. The rest of the order from eighth downwards hasn’t changed from Wednesday, with BMW’s top car in ninth, Corvette’s best runner in 13th and Aston Martin propping up the field with its two brand-new Vantage GTEs. In GTE Am, the two Dempsey-Proton Porsches remain first and second, but a 3m51.956s lap by Giancarlo Fisichella moved up the #54 Spirit of Race Ferrari to third place. The #84 JMW Motorsport Ferrari of Jeff Segal and the #99 Proton Porsche of Pat Long were the only two others to improve of the 13 runners in class.